Get a jump start on Spring cleaning by doing some early spring cleaning to clear away the winter mess and organize your winter gear for next year. I can almost feel those beautiful spring breezes and see those tiny buds ready to spring forth. That can only mean one thing, spring is on its way. This makes me ready to shed even more layers of clutter and filler around the house and pack it up for good, or at least until October-ish. If you are being bitten by the spring cleaning bug, I hope that you will join me again this month in getting our homes in springtime shape! Before I do my March Cleaning Checklist, I like to do a late winter / early spring cleaning to deal with some of the leftover winter messiness. With this March Cleaning Checklist, we will focus on packing up winter gear and cleaning out those areas where winter has hit us the hardest- mudrooms, entryways, and other winter-weary spots. 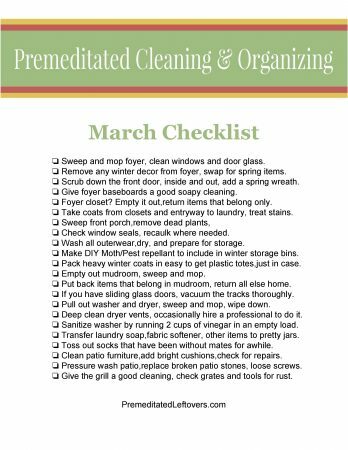 You can print out the March Cleaning Checklist here or by clicking on the image below. Let’s tackle all the entryways. Sweep and mop the foyer, clean windows, and door glass until they are sparkling to creating a welcoming entryway. Remove any winter decor from the foyer. Swap them out for spring items a little at a time until you have filled the more dark and dreary corners with lighter and brighter pieces. Put down a fresh new spring colored rug to brighten up the entryway and welcome visitors. Scrub down the front door. Give it a good scrubbing inside and out, with a good cleaner. Add a spring wreath to give some color and freshness to the front door. Give foyer baseboards a good soapy cleaning. Something with a fresh bright scent that will linger and give you that wonderful spring cleaning scent. Attack the foyer closet. Empty it out completely, return items that belong only. Keep the bare minimum of winter gear in the closet, Take coats from closets and entryway to laundry, treat stains and get them ready for storage. Remember, warmer weather is on its way! Give the front porch some attention. Sweep the front porch to clear away leaves and dirt, remove dead plants, replace one or two with something that can handle a little bit of cold just in case the cold snaps are not over. Check window seals. 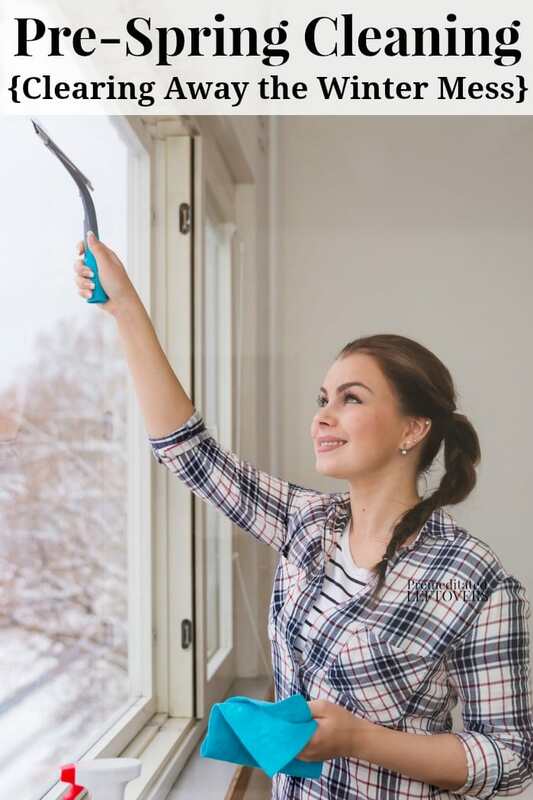 Take stock of the screens, recaulk where needed- While it is warming up now is a great time to do some maintenance on the windows. Take a walk around the house and check all the seals, caulking as needed. Wash all outerwear before drying and preparing it for storage. Heavy sweaters, winter jackets, etc… Wash, dry, and put away the ones you are not still wearing into tubs but don’t move them to the attic yet- you don’t want to be stuck climbing back up there if a late season storm hits. Make DIY Moth/Pest repellant. To include in winter storage bins, You can find my simple natural DIY tutorial for Moth Repellant bags here. Empty out your mudroom. Pull out benches, sweep, and mop. If your mudroom is also your laundry room pull out the washer and dryer to clean beneath them. Put back only items that belong in the mudroom, return everything else to its proper home. Deep clean dryer vents. It’s a good idea to occasionally hire a professional to do it.After you have finished washing all that winter gear it’s a good idea to clean out dryer vents, call in the pro’s to give it a good cleaning. Sanitize the washing machine. This is easily done by running 2 cups of vinegar in an empty load. Freshen up the laundry room. Transfer laundry soap, fabric softener, other items to pretty jars to give your laundry room a simple facelift. Dig into the sock basket. Toss out socks that have been without mates for awhile. Clean patio furniture. Add bright cushions and check for repairs. The poor neglected patio, it probably hasn’t seen much of you these last 5 months or so and I bet it’s about ready to start entertaining again. Pressure wash the patio. Replace broken patio stones and loose screws. It’s best to do your upkeep before the outdoor entertaining season starts. Give the grill a good cleaning. Check barbecue grates and tools for rust. Can’t you almost taste those hot dogs and steaks? Your home is nearly ready for spring barbecues, parties, and other gatherings! 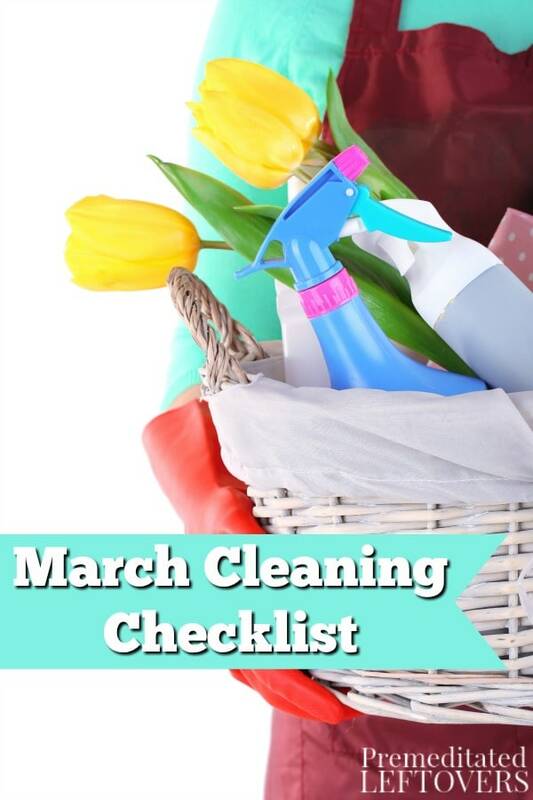 You can print out the March Cleaning Checklist here. Thanks for this! Is there an April checklist?